In the midst of Knitting and Crochet Blog Week it was my birthday. Since the blogging topics for last week didn’t really include a “jump up and down and shout about all the nice stuff you have” topic, I thought I’d wait until this week to catch up. Mr H is away in Sheffield watching the Snooker World Championships and having a well earned few days away from the little people (we think this is only the second time in 3 years that he has gone away for a night without us), so I’m having a nice, relaxing evening of catching up on Mad Men and knitting. I had made a very knitting-focussed wish-list for my birthday, so it is no surprise really that there is a lot to blog about. Firstly, my lovely children (aided by Mr H, I suspect) bought me The Principles of Knitting, 2nd edition. The first edition of this has been selling for hundreds of pounds/dollars on book sites, since it has been out of print for years. The second edition has been thoroughly revised and updated. Although it is a reference book, I think it bears reading from cover to cover. I’m on page 27 of 712, so it may take a while. The first chapter was all about how to hold the knitting needles. June (author) recommends that you learn at least 3 different ways to hold the needles and yarn so that, in the event of injury, you have a different method to fall back on. According to the book, I hold the needles according to the ‘parlor method’, a hold adapted by Victorian ladies from those using a knitting belt, but without the need for wearing unladylike knitting gadgets! I’m fairly sure that my hold developed from being more used to crocheting and feeling comfortable with having the right hand knitting needle resting in the gap between thumb and forefinger. I’m sure there will be more to write about as I get further along. 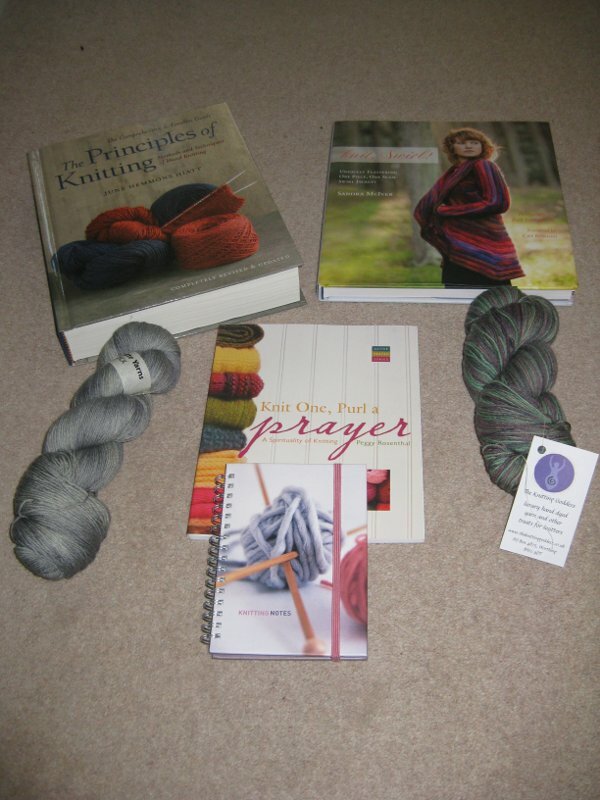 The next book is Knit One Purl A Prayer, a book on spirituality and knitting (thank you sister-in-law and family). I’ve been gradually collecting books on spirituality and knitting so that I can figure out how to merge work and knitting! This book is recently published and seems, from what I have read so far, to be from a broadly Christian perspective. Should be interesting. The last book (thank you parents-in-law) is Knit, Swirl. This is a book of patterns for a distinctive, circular construction of cardigan/jacket. Knit from the outside in, and based on either a circle or an oval, there are only four constructions, but many interpretations of the idea of a ‘swirl’. 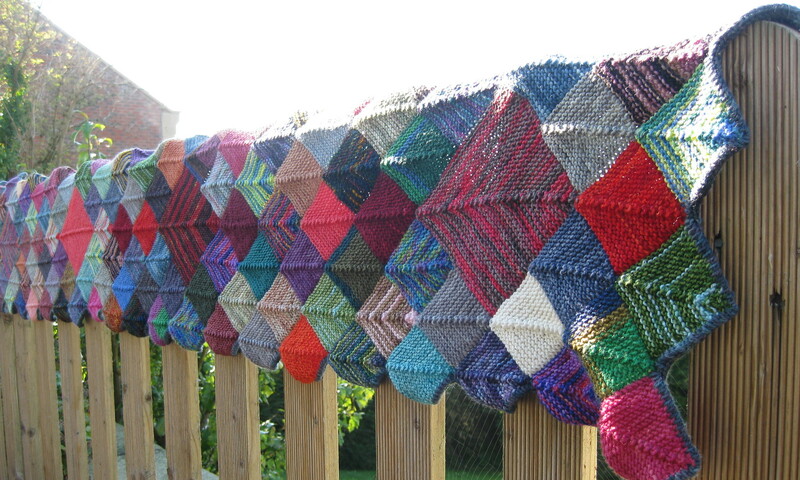 I am very much looking forward to getting the yarn to make one of these, but I may need some help choosing! There are also two skeins of yarn in the picture: some grey Smoothie Sock from Artisan Yarns and some purpley-green Knitting Goddess sock yarn. The latter was added to an order I made a while back and hidden by Mr H until now. It is dyed using a double-dipping method, so I’m very interested to see how it works out. The final item in the picture is a knitting notebook from my lovely sister. I think this may well become my travelling journal for keeping track of ongoing projects and decisions made. The next month is going to be a busy one as far as knitting is concerned. I’m trying to get my son’s SK8R jumper finished and knit a promised pair of socks for a friend by the end of May. 1st June sees the start of Tour de Sock, the six-round speed sock-knitting tournament. I’d better get back to the needles. Oh and just one more thing before I go – there is a very exciting parcel in the post to me at the moment, that will make one aspect of my knitting go much more swiftly, I hope! Looks like you had an excellent birthday! Must remember to have children myself if they give you lots of knitting presents.